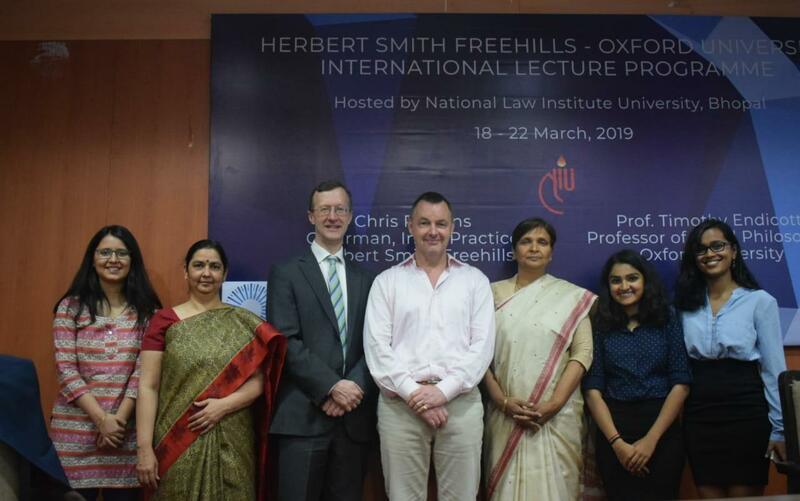 Globally pre-eminent in litigation and an international leader in corporate and finance, Herbert Smith Freehills, Herbert Smith Freehills(HSF) and the University of Oxford will conduct the tenth edition of the International Lecture Programme (ILP) at National Law Institute University (NLIU) at Bhopal. Herbert Smith Freehills is an international law firm co-headquartered in London and Sydney. Globally pre-eminent in litigation and an international leader in corporate and finance, Herbert Smith Freehills consistently ranks as one of the most prestigious law firms in the world. This International Lecture program (ILP) is a one-week course i.e. from 18 th to 21st March conducted by Mr. Chris Parsons (Chairman, India Practice, Herbert Smith Freehills) and Mr. Timothy Endicott (Professor of Legal Philosophy, University of Oxford) at top Indian law schools, covering cross-border M&A, English public law and common law and Indian constitutional law. Every year, more than 140 students from the top Indian law schools attend the ILP. Earlier editions of ILP have taken place at NLSIU, Bangalore, NALSAR Hyderabad, NLU Delhi, NLU Jodhpur, NUJS Kolkata, Jindal Global Law School and Symbiosis Law School, Pune. The participation for this event is open for only top students of top Indian law schools. Mr. Chris Parsons, Chairman of the firm's India Practice, commented, "It is a real treat for me and Timothy to teach outstanding Indian law students – their engagement with the programme is fantastic and it is received as an excellent opportunity for them to gain exposure to the practical aspects of cross border M&A and learn from a scholar of Timothy's stature. We are proud to have conducted the international lecture programme for the last ten years in India and look forward to future editions of the ILP." NLIU Bhopal, established in 1997, is one of the top law schools in the country committed towards nurturing a spirit of intellectual freedom and leadership through legal education. The ILP is the latest in its list of initiatives with leading law firms, policy centres and government functionaries. Twice Miss MP and now Miss Asia. A poetic delight for Bhopal.